Of the six downhill bikes we tested in this year’s Bible of Bike Tests, the Specialized Demo 8 II really stood apart from the rest. All of our testers agreed the geometry was perfect, and they immediately felt at home on the bike. And the traction? Unparalleled. Watch this video to find out why the Demo pushed our testers to charge harder on our DH test track near Flagstaff, Arizona. Final Take: We can keep this review brief: We want this bike. Every part on the Demo seems like it was hand-selected for its ultimate intention, rather than draped as an afterthought. Custom Avid Code X0 World Cup brakes utilizing X0 levers and Code calipers demonstrate an obsessive attention to detail. The drivetrain is a unique 7-speed setup that uses a SRAM 9-speed shifter and derailleur on a micro 7-speed Shimano cassette. Why not just provide all nine gears? Our bet is that Specialized wanted to bring World Cup details to Sunday battlers. Team Monster Energy-Specialized debuted this concept in 2010, and many racers have since tried replicating it with their own less-ingenious customizations. Unfortunately, it doesn't work flawlessly because the limit screws on the derailleur don't prevent over-shifting at the top sprocket, although a synthetic guard does help. The real standout of the show was the �–hlins TTX 22M rear shock, designed by the Swedish suspension company specifically around the Demo 8 (and Enduro Evo) exclusively for Specialized. 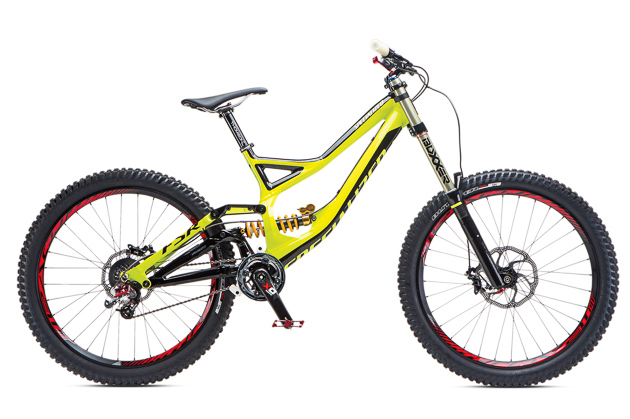 The high-volume, twin-tube design has a simple adjustment range, with high- and low-speed dials that keep the shock working within the useable range of the bike. This makes setup easy. Out on the trail, the Demo had more traction than any other bike in our test. The kitty-litter-over-hard-pack conditions asked for a deft hand, but our testers all felt they had considerably more control while riding the Demo. This stability allowed them to attack turns harder and commit to and conquer lines that were not cleaned on any other bike.